This weekend, the tastes and aromas of Fall goodies will perfume the Commons air as Ithaca’s premiere Autumn event, Apple Harvest Festival presented by Tompkins Trust Company, makes its way to downtown Ithaca. Apple Harvest Festival draws thousands to the Commons each year. This family-friendly, community tradition will take place Friday, Sept 28, noon to 6 p.m. and from 10 a.m. to 6 p.m. both Saturday, Sept. 29 and Sunday, Sept. 30 on and around the Commons pedestrian mall. Now in its 36th year, this community celebration will focus on the event’s established practices — the fresh local foods, craft cider tastings, handmade crafts, homemade baked goods, games, giveaways, live performances, and, of course, the abundance of New York State’s tastiest apples — that attendees look forward to every year. More than 20 local farmers, including longtime participants Little Grey Bakery, Bakers Acres and AJ Teeter Farm, will be selling many varieties of apples, ciders, maple products, and other delectable seasonal produce and freshly prepared baked goods. 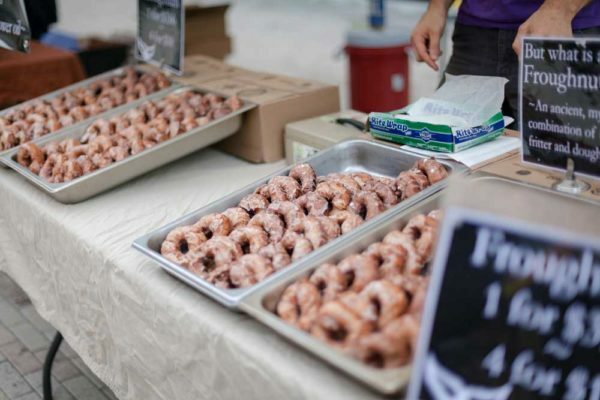 Plus, Littletree Orchards from Newfield will return with their famous apple cider doughnuts — we’ve seen lines at least 50 people deep waiting to buy this sweet treat. If you’re looking for a tasty, hot meal or snack, more than 20 different food vendors will be serving delicious dishes to suit every palate. Ithaca’s own farm to table butcher, The Piggery, will be serving local beer infused smoked sausages with homemade bacon apple topping as well as nitrate free pork and turkey hot dogs, pulled pork sandwiches, fresh kale salad with apples, apple bacon coleslaw, and maple bacon apple muffins. They’ll also sell their specialty local whiskey apple onion sausages in retail packs for folks to bring home. Festival food staples such as fried dough, blooming onions, apple crisps, and pumpkin funnel cake will also be available. In addition to the farmers and foods, nearly 70 highly skilled craft vendors from all over the region will converge in downtown Ithaca to sell hundreds of handmade items including seasonal jewelry, paintings, personal care items, sculptures, clothing, and pottery. Live performances are also part of the tradition. Throughout Saturday and Sunday, Apple Harvest will have a full lineup of acts including award-winning character education group Vitamin L, Ithaca College’s Voicestream and Jazz Ensemble, Papa Muse (high energy melodic rock), Burns & Kristy Band (acoustic pop, country, and folk), NEO Project (soul, jazz, funk), and more! The shows will be held at the Bernie Milton Pavilion stage. For those bringing younger guests, check out the free games, activities, and entertainment at the Family Fun Zone presented by Tompkins Trust Company from noon – 4 p.m. Saturday and Sunday, located inside Center Ithaca. Featured this year are free mini-golf, a balloon apple tree sculpture created by Amazing Pete and a puppet show by LilySilly Puppets Sunday at noon. Parking for the festival will be available in the Green, Seneca and Cayuga street garages for $5 on Saturday and Sunday. Concurrent with the Apple Harvest Festival, 2 Funny Entertainment will present its Finger Lakes Comedy Festival from 7 p.m. to 11 p.m., Friday, Sept. 28 through Sunday, Sept. 30. Nationally touring comedians will be performing at Toko Imports in the historic Dewitt Mall and at Wine & Design. In addition, the Multicultural Resource Center is presenting the First Peoples Festival, an annual celebration of indigenous culture, on Saturday from 11:30 a.m. to 5:30 p.m. at Dewitt Park, 315 North Cayuga St., Ithaca. The event will feature a traditional opening at 11:30 a.m., followed by live music, performances, arts and crafts, food vendors, children’s activities, and a smoke dance competition. For more information on any of these and more spectacular events happening downtown, visit our Facebook Event Page or www.downtownithaca.com.